Today I wanted to talk about my favorite face masks and it has been a hot minute since I talked beauty on here and that needed to be fixed ASAP. I'm a huge advocate for a weekly face mask! Not only are they good for your skin but they're also really relaxing. I love spending a Sunday afternoon with a face mask some coffee and Netflix, its like the perfect day for me. And of course there are some face masks I like more than others and I wanted to share my favorites with you! This is my all-time favorite face mask. It's perfect for when you feel all clogged up because its a peel off mask that helps pull out all the dirt from your pores. I focus this mask around my nose and chin where I see the most blackheads because 1. putting it all over my face would hurt so much getting it off and 2. its a huge waste of product if you don't have clogged pore everywhere. I'm a new convert to sheet masks. 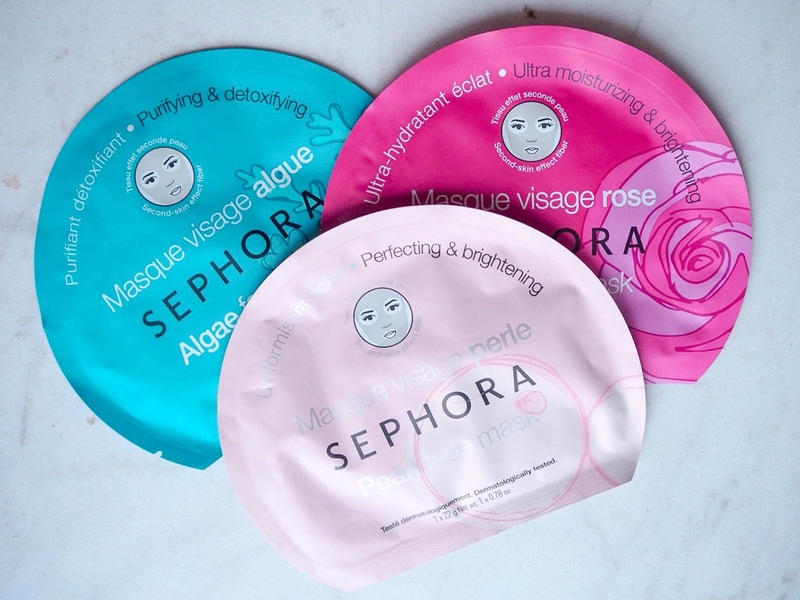 I don't really like how slimy they feel and sheets are rarely proportioned correctly for a face but despite that the Sephora brand sheet masks changed my mind. My favorite that I've tried so far is the Rose one. It was so moisturizing and made my skin feel amazing during the dry Winter! I love to use this mask when my skin is feeling dull and I'll put it on a few minutes before my shower so a can rinse it off easily in the shower. Clay masks are great exfoliators and my skin feels silky smooth and after using this mask my skin looks so bright and flawless! That wraps up my favorite masks! Are there any masks you love that I should try out? Hello Everyone and welcome to the new year! This year I really want to be the year of my blog! Although I'm off to a horrible start since its already January 8th and I still haven't published this yet... Anyways lets just get on with the goals! 2017 has basically been one very long writers block. I barely blogged in 2017. I have a ton of ideas but just never felt inspired to sit down and write and I don't know why because I love my blog. I really want to sit down and focus on writing at least twice a week this year. I think everyone in social media can relate to this one. It's so hard not to get caught up in numbers and watching everyone around you grow when you're not. I really want to focus on making the content I want to make and not on shots than get likes and views. I'm a very shy person and talking to new people can be hard for me, especially when basically everyone else knows each other. It also doesn't help that people tend to stick to with people they know which makes it even more intimidating to go up to people (at least me lol). But this year I really want to make the effort to get out of my comfort zone and meet new people! This past year I've made a few videos here and there and I've actually really enjoy filming and editing a video so I definitely want to up the ante with my channel and really start posting regularly. These are the 4 goals I really want to focus on in 2018! What goals do you have for the New Year?